Medical identity theft can be difficult to detect, but judicious planning and patient engagement can be effective deterrents. Most people are familiar with identity theft, but medical identity theft is still flying under the radar. If current trends continue, however, it won’t be for long. The World Privacy Forum estimates that between 250,000 and 500,000 people have been victims of medical identity theft. Meanwhile, the 2010 white paper “Cybercrime and the Healthcare Industry” by RSA, the security division of EMC, which deals with IT as a service, estimated that medical identity theft costs individuals an average of $20,000 per incident compared with $2,000 for financial identity theft. Most experts agree that the incidence of medical identity theft is increasing, but because it’s hard to detect and an individual’s record can be used to submit multiple false claims, it’s extremely difficult to measure the monetary—and personal—cost. Judging by the number and cost of data breaches—essentially unauthorized viewing of patient records—medical identity theft is likely costing the healthcare system billions of dollars each year. A 2011 Ponemon Institute study found that data breaches had increased 32% from the previous year, and 96% of hospitals reported at least one data breach in the previous two years. The study also found that the average cost of data breaches to healthcare organizations rose $183,526 between 2010 and 2011 to approximately $2.3 million. A 2010 Ponemon Institute study estimated that data breaches cost hospitals nearly $12 billion annually. Unfortunately, the medical industry is far behind the curve when it comes to detecting and preventing identity theft. Although most, if not all, providers are aware of its potential consequences, few are prepared to deal with it. Less than one-half (47%) of the hospitals in the 2011 Ponemon study said they have sufficient policies to efficiently prevent or quickly detect unauthorized patient data access, loss, or theft. Before medical providers can begin to curb medical identity theft, they need to know the forms it can take. Harry B. Rhodes, MBA, RHIA, CHPS, CPHIMS, FAHIMA, director of HIM solutions for AHIMA, says it generally falls into one of four types, including one-off cases in which a person tries to obtain medical care using someone else’s medical insurance information. So-called Robin Hood cases, in which a person lets a relative or friend use their information, fall under this type. However, in some instances, the individual whose medical information is compromised may be unaware of the connivery. Although this may seem like a benign crime, it can have catastrophic consequences for the person whose identity is used. Aside from the potential for unauthorized charges on their insurance, medical information is almost certain to be altered in a way that may have serious repercussions when the victim seeks medical care for himself or herself. For example, a nondiabetic may receive an insulin injection or a transfusion may be administered using the incorrect blood type. In another type of medical identity theft, unauthorized medical information is used to obtain prescription drugs, particularly narcotics, that can then be used or sold. Frequently, the person who commits the fraud is someone the victim knows. The victim may then face an array of consequences, ranging from denial of necessary medication to criminal prosecution. A more insidious type of medical identity theft is insider crime. Those with access to protected health information have the opportunity to submit false claims or even create their own accounts. This type of behavior is even more problematic in small organizations because a single person may have a great deal of control over medical records. Once a person’s medical information has been compromised, it can be very difficult to set the record straight. The information can be sold multiple times and used to submit claims that are nearly impossible to trace. The system places the burden of clearing the record on the patient. Healthcare organizations may assume the victim is trying to avoid paying for legitimately rendered services. The bill will often be paid to keep creditors at bay while trying to resolve the claim, which can be extremely difficult and time consuming. 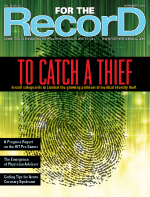 Detecting and preventing medical identity theft requires effort on multiple fronts. The most fundamental defense is to ensure that the person trying to obtain medical services is who he says he is. Paul Donfried, managing director of identity solutions for Verizon Enterprise Solutions, says the healthcare industry needs to move beyond user names and passwords for identity authentication. In security terms, authenticating a person’s identity comes down to three factors: something they know, something they have, and something they are. Donfried recommends that two of those factors be used for patient identification. Strong authentication needs to be intuitive, flexible, and minimally disruptive to users if it’s going to become a part of healthcare delivery. Increasingly, this is becoming possible through existing technology. Companies are developing biometric technologies that, unlike in the past, do not require specialized equipment or new interfaces to function. Tasks such as voice recognition, facial recognition, and even retinal scans are becoming options on mobile phones and notebook computers. It’s also possible to use cell phones—something most patients have—as unique identifiers. It’s simple to register a cell phone, Donfried says, adding that there are numerous techniques that can be used to verify identity. For example, a one-time password can be sent via text message or an interactive voice response call can be placed. When combined with a four-digit PIN, these technologies provide stronger and more flexible identity authentication. While up-to-date technology is necessary, Bob Chaput, CISSP, CIPP/US, CHP, CHSS, CEO and founder of Clearwater Compliance, LLC, says a risk analysis should be the first order of business. Too often, he says, this HIPAA-mandated step—which should reveal an organization’s vulnerabilities—isn’t thoroughly considered by management teams. Staff training also is important. It’s imperative to have clear data security policies, procedures in place so employees know exactly how they’re supposed to perform their duties, and support from the executive level. Chaput says employees need to know what to do when a patient arrives at the facility, how patient information should be handled, and what to do if they notice anything out of the ordinary. The human factor is perhaps the most overlooked component of a strong data security defense, he notes. Employee morale is another concern. A happy employee is less likely to compromise medical information and be more cognizant of any potential transgressions. In addition, facilities should conduct background checks on new hires in case there are character issues that may be reason for concern. With more facilities implementing EHRs, technology controls need to be strengthened. Antivirus and antimalware protection are essential; data should be encrypted. As mobile devices become a larger part of the healthcare data continuum, encryption will become even more important. However, facilities should not forget to keep paper records locked up as well. Because smaller practices often use the Internet for data management, Rhodes says they should create a simple checklist to keep track of which employees have access to data, bank accounts, user names, passwords, assignment of benefit tools, and other sensitive information. Each time access to the Internet tools changes, the office manager should update the information. Rhodes recommends a checklist with employee names, their level of access, and history changes. When an employee resigns or is terminated, the office manager should retrieve the Internet user checklist from the employee’s file. The tool will be useful when canceling all Internet access for a former employee because the manager will not have to rely on memory to determine which Internet tools were assigned to which employee. Along with managing the human aspects of data security, healthcare organizations can improve their chances of catching medical identity theft by studying their data. Unusual data patterns are often a tip-off that something is amiss. Rhodes says predictive data modeling similar to what the Centers for Medicare & Medicaid Services uses—which is based on a Verizon algorithm—to find Medicare fraud helps spot anomalies with the goal of detecting malfeasance before payments are made. Signs something fishy may be happening include multiple records for the same patient and multiple claims for the same type of treatment. Rhodes also recommends using tools from the National Correct Coding Initiative. Because many people who commit medical identity theft don’t work in healthcare, they often submit claims that don’t follow coding rules. Trained medical editors who spot these unusual codes may be on the road to uncovering fraud. In addition, medical facilities should work with their patients to combat misconduct. A consumer liaison can help facilities discover billing irregularities by pointing out bills that list services that were never received, contain incorrect providers, or misidentify the patient. However, many healthcare organizations fail to utilize this valuable information source. Patients should be encouraged to examine their explanation of benefits and immediately report unusual charges or significant reductions in lifetime benefit caps. The sooner medical identity theft is discovered, the better the chances of minimizing the damage. Although the crime can cause monetary and reputational damage to a healthcare organization, it has a much deeper and more lasting effect on patients.